Enjoy the carefree condo lifestyle in this elegant low-rise Barry Hobin designed complex. 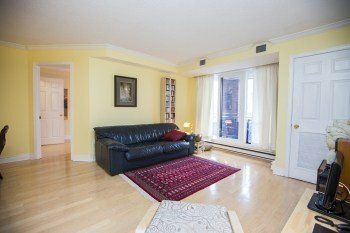 Beautifully situated across from the Rideau Tennis Club and Rideau River Bike Path, you can enjoy the quiet residential neighbourhood feel yet walk to all your amenities including the famous historic Byward Market, University of Ottawa or even Downtown. Inside you’ll appreciate the elegant layout upgraded with beautiful light hardwood floors throughout and new energy efficient windows and doors. The spacious bedrooms are conveniently located at opposite ends of the condo with full bathrooms available to each! Enjoy a warm sunlit space with formal dining room, spacious living room – convenient in-suite laundry room and a comfortable covered balcony to overlook the peaceful neighbourhood. Dual access to the balcony from the living room and second bedroom/den. or Click on the Youtube Video below to get a better view of this home. With western exposure you’ll be able to enjoy the afternoon sunshine on the balcony or streaming through any of the brand new windows. Nothing to do here but move right in. Location Location: Outside you’ll find most every amenity close at hand, groceries, restaurants, even the Byward Market and Downtown. Relax in Riverain Park one block away or enjoy a game of tennis at the Rideau Tennis Club across the street, or walk or bike along the Rideau River Eastern Pathway. You’re close to everything Ottawa’s urban centre has to offer yet quietly tucked away off the beaten path with lots of recreational areas close by. You can even walk across the river and enjoy outdoor Theatre at Strathcona Park on a warm summer’s eve. Also, just one block from the new Somerset Donald Foot Bridge which will take you right across to Sandy Hill and an easy walk Ottawa University. This will make you 1 block from Sandy Hill which is sure to cause an increase in the value of the property. Great investment: buy and rent for a couple of years. Or buy for the student attending Ottawa U to share with a roommate and look forward to a profit at the end of school. Considered Very Walkable by Walkscore.com you can click on the map below and move it around to see exactly what’s going to be close to you. Click on the attachment below to view the Property Details such as taxes room sizes etc.